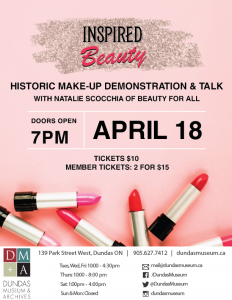 Join the Dundas Museum and Archives and Natalie Scocchia of Beauty for All for an engaging exploration of makeup history. How did the Elizabethans wear makeup? Did the Victorians even wear makeup? How do we express ourselves on Instagram today? Find the answers to these questions and more and learn the basics of creating your own 1950’s pin-up inspired makeup look!